Genasun’s Ceramic controllers set a new benchmark for reliability. Traditional controllers have components filled with fluid electrolytes that boil off over time, causing system failure. Genasun Solid Ceramic controllers have no fluid. They don’t wear out in the heat. Backed by an industry leading 10 year warranty, these controllers take reliability to a new level. 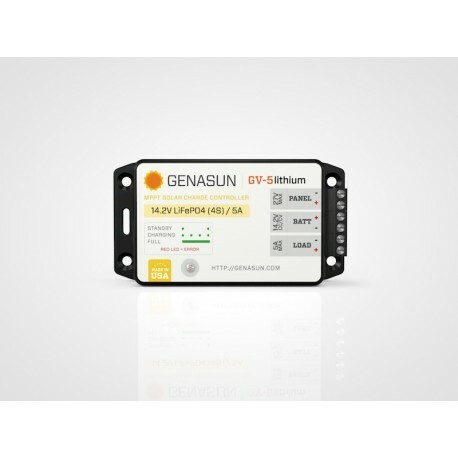 Genasun stocks the GV-5 in a variety of charge profiles for the most common Lithium chemistries and cell configurations. Custom voltages can be programmed at the factory to match the Float Voltage (CV voltage) of your battery. Please select the Custom Voltage option from the drop down, and email support@genasun.com to specify the voltage.